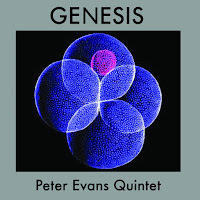 About a minute into Genesis, the new album from Peter Evans Quintet, my wife looked over at me and asked, “What is this? It’s beautiful.” The “this” she asked about was “Introduction,” the first half of the suite “Fanfares,” an extended solo from Peter Evans. And it is definitely gorgeous. Genesis, like Lifeblood, is another 100-minute album compiled from performances in 2015 and 2016. As a fan who doesn’t get out much, it’s fantastic to hear a release like this within a year of its recording. There’s no lineup change from Destination: Void, so again it’s Evans on trumpet and piccolo trumpet, Sam Pluta on live electronics, Ron Stabinsky on piano and synthesizer, Tom Blancarte on bass, and Jim Black on drums, percussion, and electronics. Genesis consists of four new suites: “Fanfares,” “Genesis/Schismogenesis,” “Patient Zero (15 Scenes),” and “3 for Alice (Coltrane).” The Janus-faced quintet continues to blur the lines between electro and acoustic, primarily through Pluta’s live quoting and reassembling of, particularly, Evans and Stabinsky. Blancarte (a little low in the mix, for about half the album) and Black simultaneously buoy the band and propel it forward at a breakneck speed. It’s a type of highly-controlled chaos, with a classic hard-bop center. It feels strange to say (though maybe less so in the context of Nate Wooley’s 2015 quintet tribute) but it feels like you could draw a solid through line from the Evans quintet to Wynton Marsalis’s 1980s quartet. After Stabinsky joins Evans towards the end of the introduction, “Fanfares” proper kicks in, and the band goes racing, tumbling, and, yes, swinging. It’s not long before a Stabinsky solo is suddenly fed back at you, highly distorted at variable speeds, that you catch where Pluta is folded into the mix. Meanwhile, Black glides from open ride to hi-hat, sliding across toms in tandem with Evans’s octave-leaping runs. 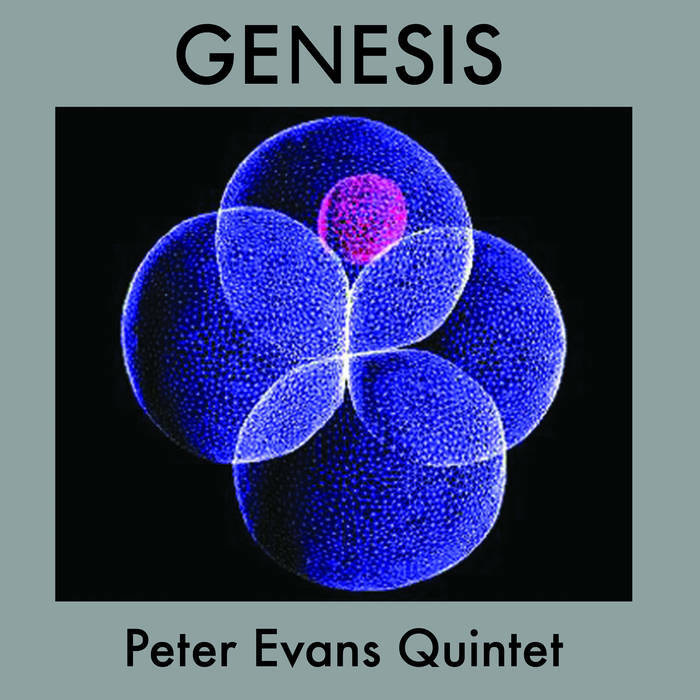 “Genesis/Schismogenesis,” organized into four stages, opens with contemplative beauty, Black on percussion and Stabinsky’s gentle chord blocks playing against Evans’s alternately plaintive and fiery exploration. Gradually, all the parts are drawn into an urgent center that just as smoothly flies apart. There’s a peculiar tension when parts align, the suspense that whatever comes next will be unpredictable, wild. The final section, “Stage 4,” features a utterly brilliant unison melody. “Patient Zero (15 Scenes)” opens with a dread-infused keyboard motif that recurs throughout the suite, acting as a clapperboard between each “scene.” I’m fairly certain it’s a John Carpenter sample, but I couldn’t find the exact source; if it isn’t, well, it strongly evokes his scores from Assault on Precinct 13, Halloween, and The Fog, setting the mood for the next 15 minutes. After several recurrences, however, even the motif dissolves, with Pluta drawing out long sequences of effects, distortion, and high frequencies, interwoven with some unconventional improvisation from Evans. And then there’s “3 for Alice.” At 47 minutes, it could be an album all on its own. More love for Blancarte here, who moves into the foreground (he’s also helped by a great mix on the final suite). “Intergalactic,” “Elemental,” and “12 Earthly Branches” are separated by brief interludes, the first of which highlights an incredible Blancarte solo. Stabinsky fills “Elemental” with fleet, gorgeous runs, and Black pulls back slightly, settling into a mellow swing groove. This winds its way to another tightly-wound unison line that takes the tempo to an almost unreal place, leading right into an improvised duet from Pluta and Black (duo album from these two, please). And “12 Earthly Branches” finishes the album with 15 straight minutes of big-hearted fire. The group starts and stops on arrhythmic beats, rapidly shifts tempo, turns sharp corners, and flat-out swings like very few bands out there. One final note. After assembling some notes, I went back to read our past reviews of the quintet, and I found that Joe Higham had written the following about the debut Ghosts: “Blancarte holds the whole thing together, probably more than we actually notice” and “This for me is where Wynton Marsalis could of gone with his classic 4tet, but never did [sic].” It was interesting to see that two reviewers, years apart, would come to similar conclusions.